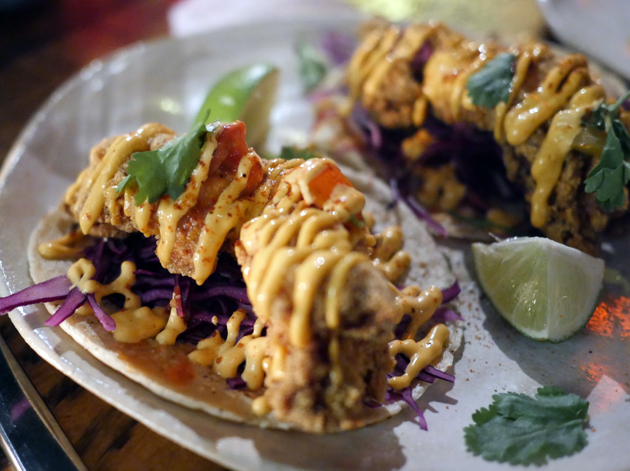 Street food has been a significant force for change in the way Londoners eat out. Street food market stalls lack the comfort and convenience of a fully fledged restaurant, but they can easily rival, match or even exceed the culinary standards of some restaurants – especially when it comes to cuisines that, historically, have been badly or under-represented in the capital. They can be inexpensive too – high quality cheap eats are always welcome in a city that’s becoming increasingly expensive to live in. Some street food stalls have acquired permanent premises and made the transition to become proper restaurants. But, to my surprise, that trend doesn’t suit everyone. A surprisingly large minority of Kangaroo Face’s work chums decry this as ‘selling out’. Even without a fuller account of their point of view, this seems immensely stupid and short sighted. The move from food truck to restaurant not only means broader opening hours and an easier to find address for the customer, but also proper facilities (such as running water and shelter from the elements) for the kitchen to give its vision better form. Plus, it frees up stalls for the next generation. Breddos Tacos is the latest street food operator to trade tarpaulins and portable hotplates for indoor toilets and the ability to accept credit cards. It’s just around the corner from Luca, but it couldn’t be more different with semi communal tables, moodily dim lighting and hipster-ish décor that’s more Hoxton than Clerkenwell. It’s the menu that makes Breddos interesting though. I was greatly impressed by their earlier street food iteration which, while deviating from tradition in its choice of taco fillings, was easily good enough to trump far glitzier and plusher competition. 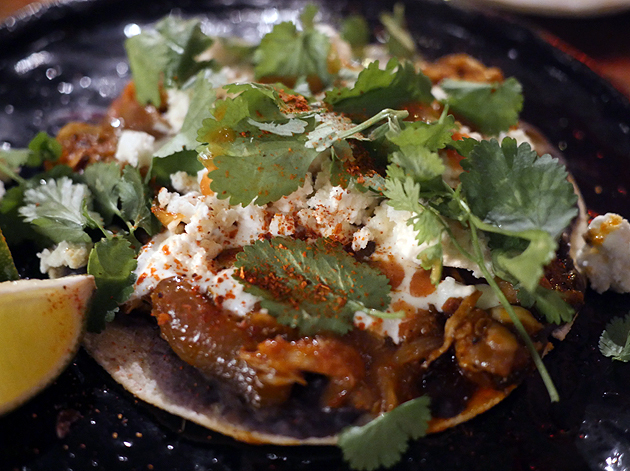 Breddos’ restaurant continues this Mexican-but-with-other-influences theme. 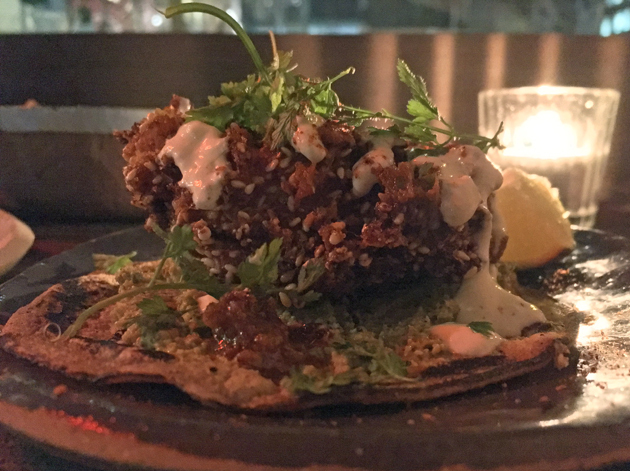 A taco filling of battered sweetbreads was immediately and intensely impressive. A crispy, lightly chewy batter somehow managed to hold in a bulging, bulbous bauble of offal. Softer, squidgier and richer than a Davos attendee, it was an offal tour de force. 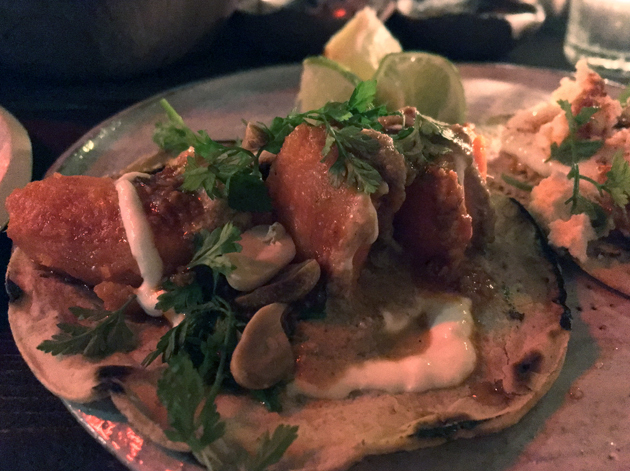 The only slight against the sweetbread tacos was a modest problem that also afflicted the other tacos – the quality of the tortillas. Apparently made from corn and properly nixtamalised, the tortillas were nonetheless oddly chewy and verged on blandness with a very muted nuttiness. They were far from bad though – moderately thick and fluffy as well as defiantly sturdy under the groaning weight of the generously proportioned fillings which were prone to a little spillage. Distinctly sweet and fluffy chunks of sweet potato were delightful in their own right, even if they did drown out the various garnishes and sauces. A more balanced vegetarian taco filling was one of fried egg. The rich and runny yolk, its orange hue enhanced by the neon hues of Breddos’ lighting bleeding in through the windows, didn’t overwhelm the subtly moreish mole or the refreshing and wispy cheese. You only get one taco per portion. This allows more mixing and matching, but also makes the pricing appear artificially low if you’re used to, and expecting, the two tacos per portion standard of elsewhere. 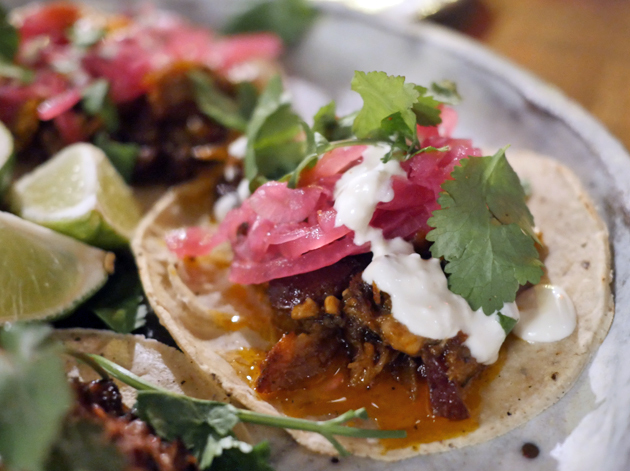 Don’t skip straight ahead to the desserts after finishing your tacos – the Al Pastor pork is a must have. 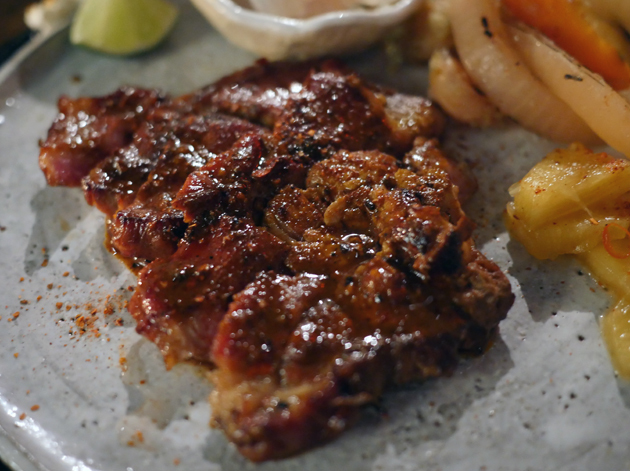 A dense, chewy and well-seasoned fillet of Old Spot pork almost resembled game. Its fruity undertones meshed well with the wallop of the pickled watermelon, veg and chillies served on the side. These accoutrements only made the sharp pineapple, which was lovely in its own right, all the more unnecessary in the end. It’s not the best pork dish you’ll have in London, but it’s not far off. 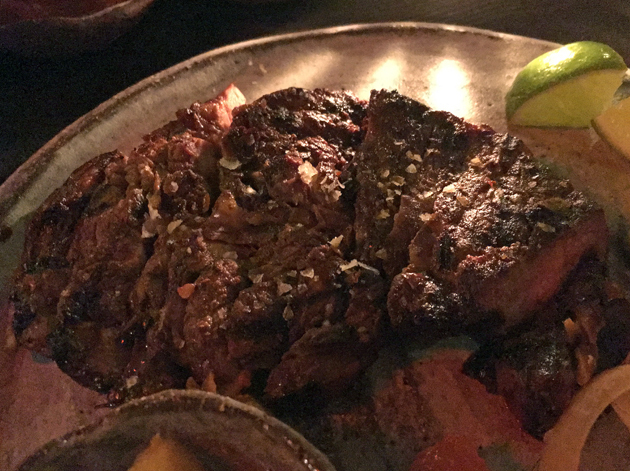 It would be easy to overlook the tortillas and sauces served at the beginning of each meal at Breddos, but it would be a mistake to do so. Nutty, crisp and light tortilla chips were the perfect conveyors for the sauces. These can vary from week to week, but a zesty and sprightly green sauce was perfect for those that can’t handle chilli heat. A smoky, sizzingly punchy red salsa was a delight for those that can, but without overwhelming and spoiling the palate for everything else. Tres leches ice cream was an odd beast. It was very dense and elastic, much more so than gelato, but not to the same extent as Turkish dondurma. Even so, it was substantial enough to fuel hill walkers and mountain climbers. It didn’t really capture either the sweetness or milkiness of traditional tres leches cake though. 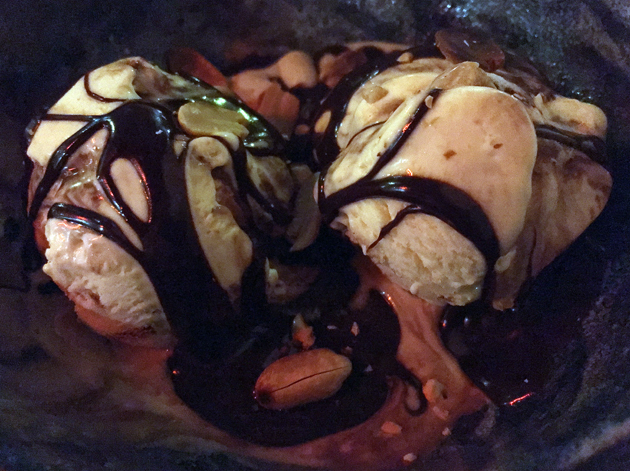 The crunchy peanuts were neither here nor there, while a drizzling of fudge quickly congealed into surreal ribbon-like strips that added even less to the mix. An interesting, but ultimately flawed dessert. 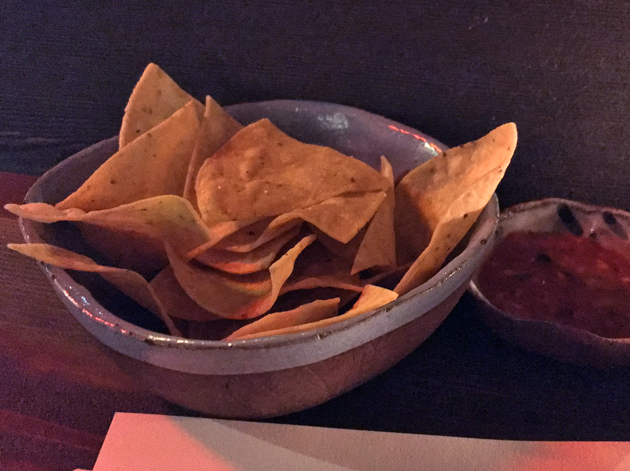 This review’s procrastination was brought to you, in part, by eating at London’s other new Mexican restaurants. Reviews coming imminently. Honest. Musky Rider is a novice to the joys of non-Tex-Mex food and is a riotous laugh too, making him the perfect dining companion for my second and final meal at Breddos. 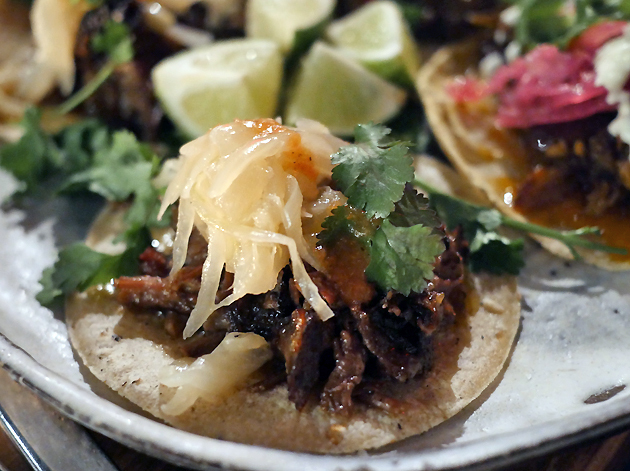 He was immediately taken with the beef short rib tacos – tender, unctuously moreish beef was a true delight, with sweet vineagary onions cutting through the fatty bovine richness. The tortillas were a tad nuttier and sweeter this time around, but there wasn’t much in it. Although less visceral and immediately accessible than the beef short rib tacos, the filling in the pork tacos shouldn’t be overlooked. Moist and tender pig meat was blessed with a subtly fruit moreishness, while sharp pickled onions and lightly soured cream neatly offset the meatiness. A class act. Where ‘cream over my meat’ is finally no longer either a joke or an obscenity. I’m usually underwhelmed by fried chicken, especially with the so-so poultry typically stuffed into a taco, but that wouldn’t be the case if everyone could match Breddos’ artistry with the deep fat fryer. The apparently corn-based batter here was exceptionally crisp and light, entirely free of excess oil, with the chicken underneath somehow managing to be wispy and light, almost to be point of resembling fish, yet finishing off with a squidgy, meaty plumpness. 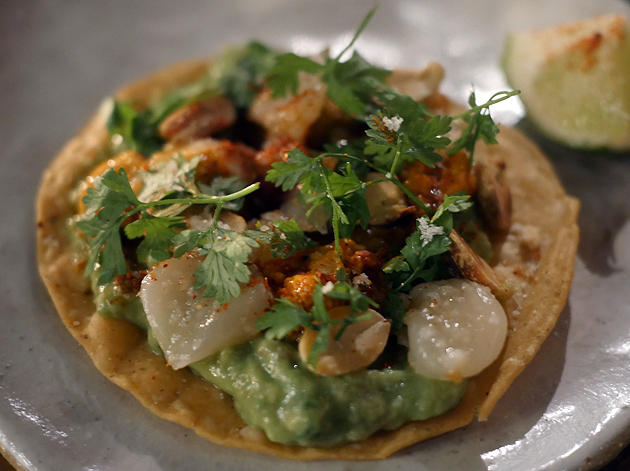 A few other reviewers have turned up their noses at the sea urchin tostada. Don’t listen to them. The funky, salty umami of the buttery soft sea urchin was a visceral, sensual pleasure fit for a queen. Creamy sweet and equally soft scallops with a clean aftertaste was the perfect follow-up. The only let-down was the crunchy, stodgy fried tortilla base which tended to get in the way of the double-punch seafood. 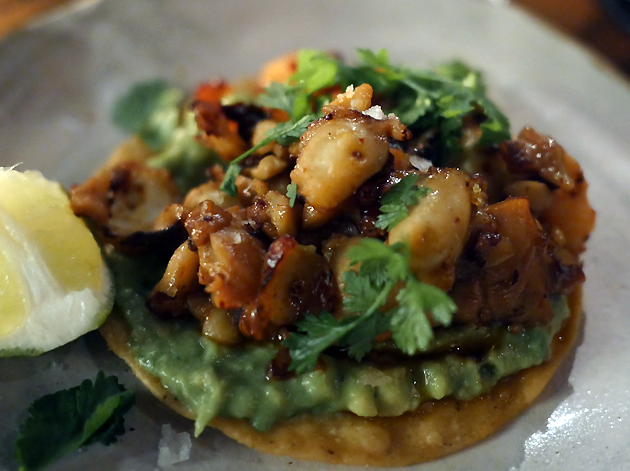 The octopus tostada didn’t quite reach the same visceral heights as the sea urchin variant, but it wasn’t too far off. Tender, yielding segments of octopus had a gentle yet evocative salty tang of the sea that was somehow complimented, rather than overwhelmed by the creamy sweet avocado puree. All of this managed to hold their own against the stodgy fried tortilla base too. I’m not usually a fan of tostadas, but I can get on board if the toppings are as excellent as these. Plump and juicy mussels, already far more impressive than the flaccid and underperforming molluscs at Belgo, were taken to another level by a gently spiced sauce dotted with a hefty helping of minced pork. The levels of umami, sea saltiness and peppery spice were intensely, thigh-rubbingly satisfying. 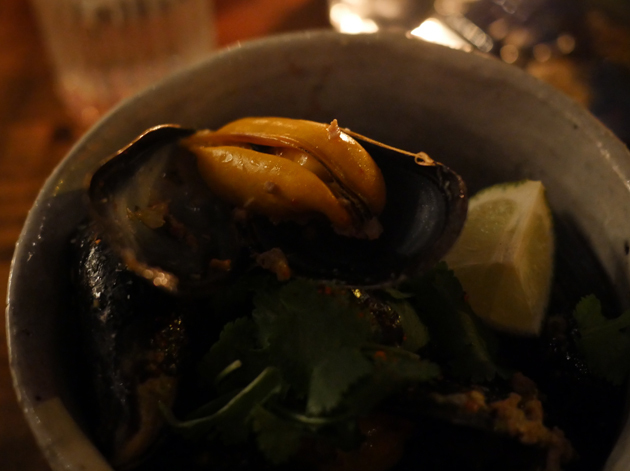 It was almost like a miniature Som Saa curry and came close to outclassing the mussels themselves. The sauce is unpictured. There’s only so much I can do in dim lighting, y’know. Breddos’ tlayuda was noticeably smaller than the ones I tried in Oaxaca and with a base of just one rather than two tortillas. It was a good ‘un though – lightly baked with a gentle chewiness. It was topped by a duo of moreish and moist, if somewhat underwhelming chicken and a far more interesting cheese that was wispy and light, yet creamy too. There’s potential here, but it’s telling that, at the time of writing, Breddos has yet to roll out a more extensive selection of tlayudas as promised in their initial sample menu. I await their future efforts with keen anticipation. Don’t call it a Mexican pizza. A version of pork Al Pastor using a standard cut of pig was, unsurprisingly, not as superlative texture-wise as the Old Spot version from my first meal at Breddos. It’s still worth savouring though – tender, occasionally fatty strips of swine flesh had hints of fruit and a moreish undertone. Sharp pineapple segments as well as a briney and vinegary selection of pickled onions, chillies and carrots proved complimentary, both with each other and with the pork itself. The interplay of meatiness, tingly heat and sharp sweetness was a lip-smacking delight. Don’t laugh too much or too loudly, otherwise the wannabe Sloaney, cocktail-sipping brigade will give you dirty looks. 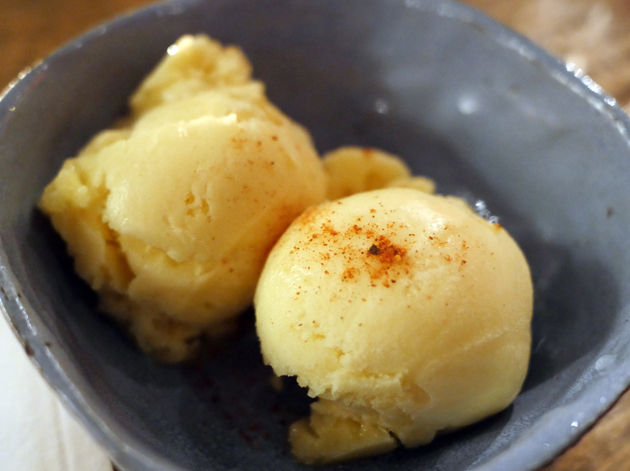 I wasn’t expecting much from the passion fruit sorbet, which made its smoothness and lack of uncomfortable icy crunch all the more welcome. Just as importantly, it captured the evocatively sweet sugary sharp essence of the fruit. The state of Mexican food in London has progressed since my original burrito and taco group test, albeit in fits and starts. Breddos’ cooking doesn’t quite have the same precision and nuance as the now sadly-closed Santo Remedio, but it comes very close. Even so, the bold, uncompromising and layered flavours of its sauces, meats, taco fillings and even its tostada toppings are treasures to be savoured. 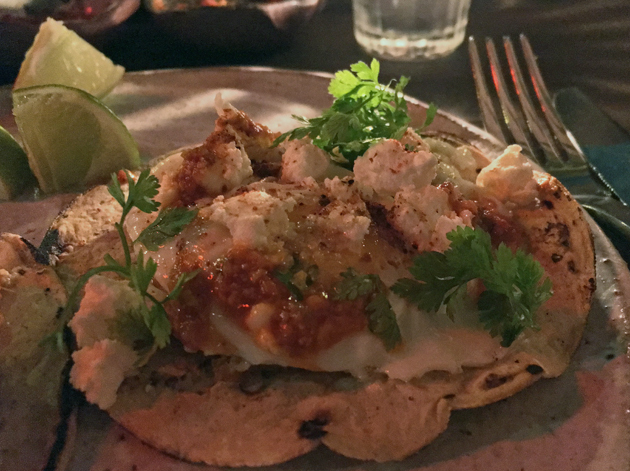 Breddos is one of the few Mexican restaurants in London that captures some of the feel of Mexico’s complex and strident food culture, while also charting its own course and crafting its own identity with non-traditional ingredients and techniques. The dining room is a little too dark, the friendly service can be scatty and the seating could be plusher. But Breddos’ food more than makes up for all of that. It’s not only thumpingly good, it’s a soothing balm for the soul and I hope it never closes. Opening Hours: Tuesday-Friday noon-23.00 and Saturday 13.00-23.00. Closed Sunday. Tags: breddo's tacos, egg, london, octopus, pork, restaurant, review, scallops, sea urchin, short rib, sorbet, sweet potato, sweetbreads, taco, tlayuda, tostada. Bookmark the permalink.